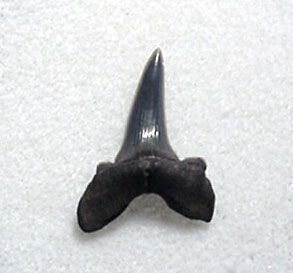 Buried Treasure Fossils offers incredible Georgia fossil shark teeth and Megalodon teeth for sale. Georgia is producing extraordinary colored Megalodon shark teeth from the rivers in and around Camden and Chatham counties. Teeth are recovered in gravel holes at the bottom of these rivers. Divers must fight off rapid currents and little to no visibility in water depths of 30-50 feet to find their prize. These teeth are from the Hawthorne Formation - Miocene in age (15 million years ago). Authenticity guaranteed. Want to buy a Megalodon tooth? Have a look. Georgia Fossil Shark Teeth Shark Teeth By Species. A TOP QUALITY BLACK Megalodon tooth from the Miocene of Georgia. A "Designer Meg tooth" with outstanding jet black enamel with white cloud patterns on the display side! The enamel is the Highest Quality with few hydration cracks. An exceptional, large black colored bourlette which is mostly complete. A fantastic color combination. Razor sharp serrations including a good tip serration. The root is nicely articulated and complete with typical hydration cracks. Note - these Georgia Megs are fantastic - essentially no sign of wear and excellent perservation. An exceptional color collector's Megalodon tooth from Georgia. No repair. No restoration. Authenticity guaranteed. A Museum Quality Meg tooth. Another near PERFECT Georgia Megalodon tooth. Incredible color! A GEM Megalodon tooth from the Miocene of Georgia. The PERFECT GEORGIA Meg tooth. A March 2019 Fossil of the Month. The enamel is the Highest Quality with very small hydration cracks. An exceptional, large black colored bourlette with no peel. A fantastic color combination. Razor sharp serrations including a huge tip serration (essentially perfect serrations - one damaged). The root is nicely articulated and complete with no hydration cracks. Note - these Georgia Megs are fantastic - essentially no sign of wear and excellent perservation. No repair. No restoration. Authenticity guaranteed. A Museum Quality Meg tooth. A PERFECT Georgia Megalodon tooth. Best of the BEST! A TOP QUALITY Megalodon tooth from the Miocene of Georgia. A "Designer Meg tooth" with outstanding brown enamel with charcoal patterns on both sides! The enamel is the Highest Quality with few hydration cracks. 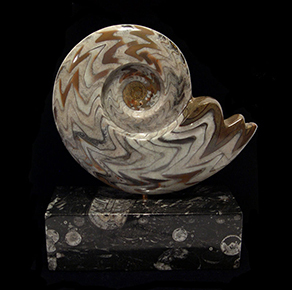 An exceptional, large brown colored bourlette which is nearly complete. A fantastic color combination. Razor sharp serrations including a good tip serration. The root is nicely articulated and complete with small hydration cracks. Check out the pathologic cutting edge waves on the right side - final photo. Note - these Georgia Megs are fantastic - essentially no sign of wear and excellent perservation. An exceptional color collector's Megalodon tooth from Georgia. No repair. No restoration. Authenticity guaranteed. A Museum Quality Meg tooth. Another near PERFECT Georgia Megalodon tooth. Incredible color! 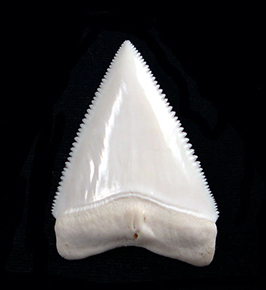 A TOP QUALITY Megalodon tooth from the Miocene of Georgia. An outstanding brown with charcoal circles designer pattern Meg tooth! 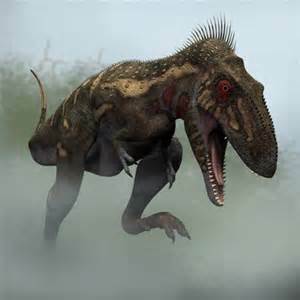 A March 2019 Fossil of the Month. The enamel is the Highest Quality with small hydration cracks. An exceptional, large brown colored bourlette with no peel. A fantastic color combination. Razor sharp serrations including a good tip serration. The root is nicely articulated and complete with small hydration cracks. Note - these Georgia Megs are fantastic - essentially no sign of wear and excellent perservation. An exceptional color collector's Megalodon tooth from Georgia. No repair. No restoration. Authenticity guaranteed. A Museum Quality Meg tooth. Another near PERFECT Georgia Megalodon tooth. Incredible color! A TOP QUALITY Megalodon tooth from the Miocene of Georgia. The "Fifty Shades of Gray" Meg. The enamel is the High Quality with small hydration cracks. An exceptional, large "root beer" colored bourlette with no peel. A fantastic color combination. Sharp serrations including a good tip serration. The root is nicely articulated and complete with small hydration cracks. Note - these Georgia Megs are fantastic - essentially no sign of wear and excellent perservation. An exceptional color collector's Megalodon tooth from Georgia. No repair. No restoration. Authenticity guaranteed. A Museum Quality Meg tooth. Another near PERFECT Georgia Megalodon tooth. A TOP QUALITY Megalodon tooth from the Miocene of Georgia. An Green and Charcoal colored Meg tooth with a designer black & gray reverse! The enamel is the Highest Quality with small hydration cracks. An exceptional, large black colored bourlette with no peel. A fantastic color combination. Razor sharp serrations including a good tip serration. The root is nicely articulated and complete with no hydration cracks. Note - these Georgia Megs are fantastic - essentially no sign of wear and excellent perservation. An exceptional color collector's Megalodon tooth from Georgia. No repair. No restoration. Authenticity guaranteed. A Museum Quality Meg tooth. Another near PERFECT Georgia Megalodon tooth. A Top Quality, RED Megalodon tooth from the Miocene of Georgia. A February 2019 Fossil of the Month. The enamel is the Highest Quality with excellent sheen and very small hydration cracks! An excellent, large black bourlette - 90% complete. Incredible red color combination. Razor sharp serrations including an excellent tip serration - nearly perfect. The root is nicely articulated and complete with small hydration cracks. Note - these Georgia Megs are fantastic - essentially no sign of wear and excellent perservation. An exceptional collector's Megalodon tooth from Georgia. No repair. No restoration. Authenticity guaranteed. A Museum Quality red Meg tooth. © Copyright 2000 - 2019 Buried Treasure Fossils. All Rights Reserved.